Every now and then, Ryan Tannehill shows glimpses of being the player the Miami Dolphins hoped he would be in the National Football League that prompted them to select him in the 2012 NFL Draft with the eighth overall pick. The quarterback’s records speak for himself although he has not quite been able to maintain a level of consistency that would propel his team back to Super Bowl contention. Tannehill was born Ryan Timothy Tannehill III on the 27th of July, 1988 in Lubbock, Texas, although he grew up in Big Spring, another Texan city. It was here that young Ryan received his early education, attending Big Spring High School, where he played in three different sports; football, basketball, and track. As a part of his high school track & field team, Ryan Tannehill notably placed third in the 300m hurdles and second in the triple jump event at the 2006 District 4-4A Championships. With the football team, he first played defensive back in his sophomore before switching to the quarterback position as a junior, managing 2,510 passing yards and rushing for 922 that season. In his senior year, Tannehill managed 5,258 passing yards and 617 rushes to lead his team to the playoffs, earning second-team District 4-4A honors for the second time before graduating. The student-athlete turned down offers from schools like the University of Houston and the University of Texas at El Paso to attend Texas A&M University. This meant he had to redshirt his freshman year before joining up with the team in 2008. Tannehill found himself to be the third-placed quarterback on the team and in order to get some playing time, he was moved to a wide receiver role where he broke his school’s freshman record for receptions and receiving yards. He continued to play in the position for the 2009 season where he managed a team-high 46 receptions for 609 yards and 4 touchdowns to earn an All-Big 12 Honorable Mention honor. In 2010, Tannehill played as both a wide receiver and quarterback and was honored with an All-Big 12 Honorable Mention. Ryan Tannehill eventually got to play a full season as a quarterback in 2011. He threw for 3,744 yards and 29 touchdowns, with 15 interceptions while also completing the requirements for a bachelor’s degree in biology before heading to the NFL. Ryan Tannehill was selected by the Miami Dolphins with the 8th overall pick in the 2012 NFL Draft. He became the team’s starting quarterback in his first professional season as he went on to set the record for the most passing yards, attempts, and completions by a rookie quarterback in a single game. He also set the franchise record for the longest run by a quarterback in a single play before going on to finish the season with 3,294 passing yards, 12 touchdowns, and 13 interceptions. The quarterback was able to better his rookie season stats by finishing the 2013 season with 3,913 passing yards, 24 touchdowns, and 17 interceptions. He has since that time continued to up his game, earning a multi-million dollar, multi-year deal along the way as he holds down the starting QB position on his team until the 2017 season when he was ruled out by injury. Ryan Tannehill tore his ACL during a non-contact scramble in training camp just before the beginning of the 2007 season. The damage required him to have surgery which meant he was not going to be able to feature at all for that season, prompting his team to sign a replacement player. 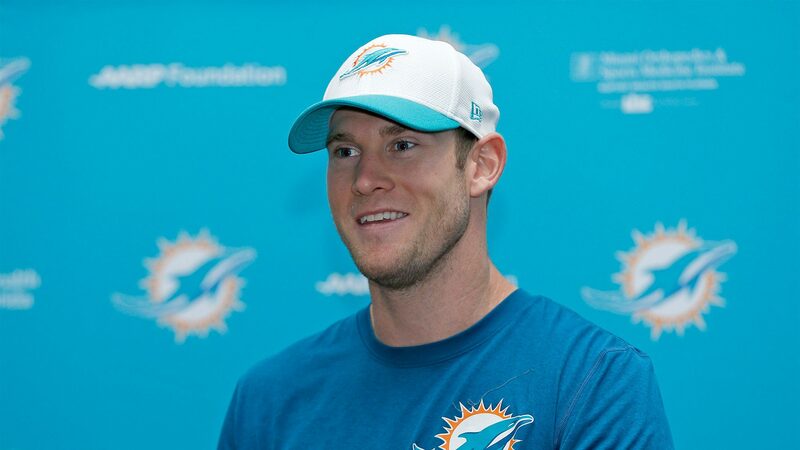 Tannehill has since fully recovered from his injury to take back the team’s starting quarterback role. Ryan Tannehill is married to the beautiful Lauren Tannehill. The couple, who attended the same university but never crossed paths on campus first met each other in 2009 during Spring Break at Panama City, Florida. They dated for about two years before getting engaged in May 2011 and subsequently exchanging vows on the 13th of January 2012. Read Also: Aaron Hernandez Bio, Daughter, Net Worth, Wife, Dead or Alive, Is He Gay? Ms. Tannehill, who was born Lauren Ashley Ufer, graduated with a major in Communications and a minor in Psychology from Texas A&M University. She played Tennis and was also a cheerleader in her younger days before going on to work as a cardiology assistant. She has since that time launched a modeling career while also starting a family with her husband. Sometime in 2016, the couple welcomed their first child, a son named Steel Ryan Tannehill who was born sometime in 2016. In May 2018, Ryan and Lauren announced they were expecting a second child.